As the earth’s temperature continues to rise, the effects of global warming are being felt in many ways. Nay-sayers may continue to try to ignore or say that it’s all part of a normal systemic process of the earth, but scientists studying millennia of evidence are proving that we are creating a problem that we may not be able to reverse. One of the most notable is the effect of global warming on Canadian glaciers. They are melting at a rate that has been simply called ‘scary’. A study that was published in the Geophysical Research Letters has resulted in the information that nearing twenty percent of all of the ice contained in the Canadian glaciers could melt by this century’s end, if the global temperature is increased by only 5.4 degrees Fahrenheit and 14.4 degrees Fahrenheit in the Canadian Arctic. This may not sound like a lot, but it doesn’t take that much of an increase on a global scale to completely wreak havoc. This melt along would bring a sea level increase by around 1.4 inches. The authors are indicating that the melting trend may be unstoppable due to the fact that the current thaw of the white glaciers will be exposing the darker colored tundra and that will soak up more of the sun’s heat thereby accelerating the melting process. Other studies in the past predicted a heavy melt and indications are showing that it may lead to an increase of global sea levels of around 2 cm. This new study is a much more detailed and precise study and researchers are taking this a lot more seriously. The shocking part is that the difference between the two outcomes is equal to 75% more water than they thought. When you add the melting areas of Russia, Greenland, South America and the rest of the world, it is predicted that the sea levels of the world will rise between 18 and 59 centimeters in this century. 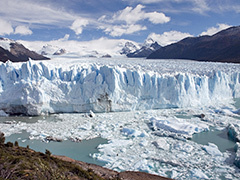 It could be more if the ice sheet melts in Greenland and Antarctica are accelerated. Posted on July 19th under Global Warming Issues. Canadians are watching the process in horror. Anyone with common sense who does a bit of investigating can figure out that a sea level rise of that amount can devastate beaches, homes and in some cases some of the islands in the ocean. It sounds so small, but when you add it up around the world, it is absolutely huge. What kind of morons don’t get this? We need to do something now to try to slow it down and maybe, with the help of some really smart people, reverse it. Yes, it is scary that the glaciers are melting and melting fast. I heard that some of the low lying smaller islands are already experiencing flooding and some have been evacuated. These people have lived on these places for generations and now have to move their entire culture. It might help if the conservative political party didn’t shove mis-information down the throats of the American people. They have a vested financial interest in the oil companies and they really wouldn’t care if they world blew up, as long as they and their families were safe. They are all-about-me people and never venture out to think of the problems global warming are causing.